MyChelle Skin Care offers clean, healthy, effective, science backed skin care at an affordable price point. I received the trio of Remarkable Retinol Serum, Perfect C Serum and Replenishing Solar Defense SPF 30 that are meant to treat, refine, brighten and protect my complexion with powerful actives and botanicals. After cleansing and using an essence or concentrate to prep my skin for maximum uptake of beneficial ingredients, I apply a serum. I make sure that any serum (or serums) I apply are packed with my skin's "power ingredients" to provide real results. One of my power ingredients is Vitamin C. This antioxidant prefects and brightens my complexion. MyChelle Perfect C Serum contains 17% Vitamin C, an effective level that will, with consistent use, deliver real and visible results to the skin. Hamamelis Virginiana (Witch Hazel) Water, Ascorbic Acid (L), Alcohol, Glycerin, Aqua (Water), Polyglyceryl-4 Caprate, Ergothioneine (L), Buddleja Davidii Meristem Cell Culture, Solanum Lycopersicum (Tomato) Fruit Lipids, Citrus Tangerina (Tangerine) Peel Oil, Lavandula Angustifolia (Lavender) Oil, Citrus Paradisi (Pink Grapefruit) Peel Oil, Elaeis Guineensis (Palm) Oil, Fructooligosaccharides (D-beta), Beta-Carotene (D), Glucosamine HCI (D), Wine Extract, Astaxanthin, Tocotrienols, Caprylic/Capric Triglyceride, Tocopherol (D-alpha), Ubiquinone (CoQ10), Benzyl Alcohol, Xanthan Gum. Full disclosure ingredients according to PCPC standards. MyChelle Perfect C Serum is a light yellow fluid that has some scent that reminds me vaguely of sulfur. It isn't strong and it doesn't linger. I don't walk around smelling like fire and brimstone or anything. Well... Not because I've used this serum, anyway. This serum spreads easily across my skin, drops in almost immediately and doesn't leave behind any after feel. I am an avid active ingredients mixologist and one of my favorite ingredients to cocktail with Vitamin C is Retinol. Another of my skin's "power ingredients," Retinol refines, clarifies, brightens, fades hyper pigmentation and post acne marks and helps to reduce the appearance of fine lines and wrinkles and provide that good Retinol glow. If you haven't tried Retinol what are you waiting for? Trust me, once you get started with this wondrous substance and start seeing what it can do for your complexion, you won't want to be without it! MyChelle Remarkable Retinol Serum contains the most potent form of Vitamin A in over-the-counter preparations. (No percentage is provided. I normally use a 2.5%.) Buffered with natural Ceramide 3 and Orange Plant Stem Cells to provide natural hydration and reduce redness. Very sensitive beauties be aware that this serum contains citrus peel and lavender oils. If you are pregnant or breast feeding, consult your physician before using Retinol. Aqua (Water), Glycerin, Gluconolactone, Retinal (Retinaldehyde), Rubus Chamaemorus (Cloud Berry) Seed Oil, Citrus Aurantium Dulcis (Orange) Callus Culture Extract, Eucalyptus Globulus Leaf Oil, Lavandula Angustifolia (Lavender) Oil, Cymbopogon Schoenanthus (Lemongrass) Oil, Citrus Limon (Lemon) Peel Oil, Tocopherol (D-alpha), Aloe Barbadensis Leaf Juice Powder, Allantoin, Ceramide 3, Pentylene Glycol, Helianthus Annuus (Sunflower) Seed Oil, Cyclodextrin, Polyglyceryl-4 Caprate, Xanthan Gum, Phytic Acid, Potassium Sorbate, Sodium Benzoate, Lonicera Caprifolium (Honeysuckle) Flower Extract, Lonicera Japonica (Honeysuckle) Flower Extract. Full disclosure ingredients according to PCPC standards. A lightweight, bright yellow creamy serum, MyChelle Remarkable Retinol Serum has a very light citrus scent that dissipates nearly instantly on application. This serum drops instantly into my skin, leaving it feeling smooth and not at all sticky. I don't experience any stinging, warmth, redness or other discomfort. I don't have sensitive skin and I've been using Retinol for years. A word to Retinol newbies or anyone with very sensitive skin: Although this serum is very gentle, go in slowly. First, test in a small spot and gauge any reaction. Start off with once or twice a week and build up, from there. Once you have treated your skin to the good actives and your skin is busily engaging in increased cell turnover and producing new, fresh, younger looking and feeling skin it is crucial that we protect our revitalized complexion with an effective sunscreen. MyChelle Replenishing Solar Defense SPF 28 provides broad spectrum physical UVA and UVB protection in the form of 13.5% Zinc Oxide. This lightweight formula contains Red Algae, Kukui and Macadamia Nut Oils to hydrate, restore moisture balance and plump fine lines. This lightweight lotion doesn't have much of a scent. It works easily into the skin without leaving it feeling oily, sticky or coated with a residue. This sunscreen is comfortable on it's own and under makeup. MyChelle Replenishing Solar Defense is safe sun protection for people of all ages and those of us who are allergic or sensitive to chemical sunscreens. Did you know that many sunscreens on the market are contributing to the death of our major coral reefs? MyChelle Replenishing Solar Defense is reef safe so you can feel good about applying this before you run out to frolic in the waves. Active: Zinc Oxide (ZinClear) 13.5%. Inactive: Aqua (Water), Caprylic/Capric Triglyceride, Candelilla/Jojoba/Rice Bran, Polyglyceryl-3 Esters, Glycerin, Isodecyl Neopentanoate, Ethyl Macadamiate, Aleurites Moluccana Seed Oil, Hydroxypropyl Starch Phosphate, Glyceryl Stearate, Hamamelis Virginiana (Witch Hazel) Water, Ergothioneine (L), Hordeum Distichon (Barley) Extract, Macadamia Ternifolia Seed Oil, Porphyra Umbilicalis (Red Algae) Extract, Santalum Album (Sandalwood) Extract, Phellodendron Amurense Bark Extract, Glyceryl Isostearate, Sodium Stearoyl Lactylate, Polyglyceryl-10 Pentastearate, Polyhydroxystearic Acid, Tocopheryl Acetate (D-alpha), Tocopherol (D-alpha), Lecithin, Malic Acid (L), Lonicera Caprifolium (Honeysuckle) Flower Extract, Lonicera Japonica (Honeysuckle) Flower Extract, Potassium Cetyl Phosphate, Hydrogenated Palm Glycerides, Alcohol, Cetearyl Alcohol, Behenyl Alcohol, Hydroxypropyl Methylcellulose, Sodium Lactate, Phytic Acid, Citric Acid, Sodium Hydroxide. Here is MyChelle Replenishing Solar Defense on the skin. In the top photo, in natural light, you can see that it is clear and clean looking with almost no white cast and my skin appears hydrated and smooth. In the bottom photo you can see that there is a small amount of flash back when exposed to my camera's flash. What all of this nattering boils down to is: MyChelle Dermaceuticals products are beautifully formulated, pleasant to use and effective. Available from MyChelle and Ulta Beauty this is a worthy and wallet friendly skin care brand that you can feel good about purchasing and using. MyChelle skin care is Vegan, Cruelty Free, GMO Free and formulated without: Gluten, Parabens, Petroleum, Phthalates, Silicones, Sulfates, Ureas, Artificial Fragrances and Colours. Visit MyChelle on Facebook, follow on Twitter, stalk them on Instagram. 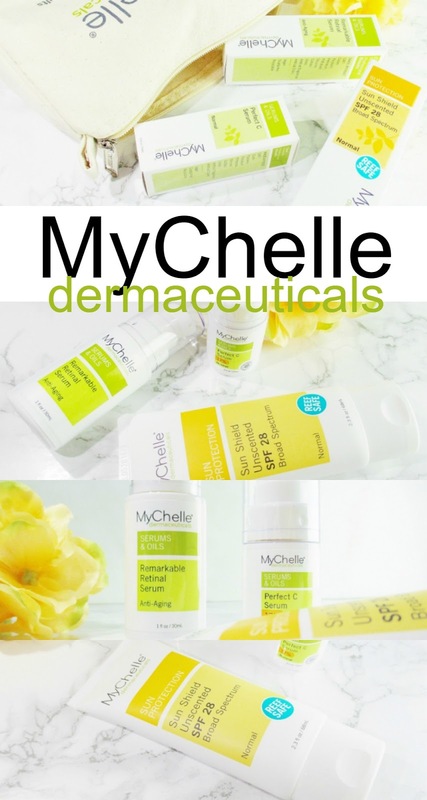 Have you tried MyChelle Dermaceuticals Skin Care? What products do you find work best for you?